Learn about New England’s greatest maritime mystery. 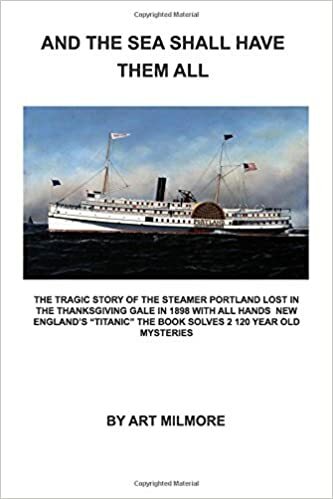 The tragic loss of the palatial side-wheel steamer Portland in the horrific gale on November 26 and 27th 1898. The ship sank with all hands, was witnessed by no-one and disappeared without trace. the wreck would not be found until 91 years later. Our presenter – Art Milmore – will explain exactly how and why the ship sank. The storm defied all logic, as the wreck was found over 25 miles from where it was thought to have sunk. for this was a storm like no other with 100 miles per hour winds,40 foot waves and zero degree temperatures. Before it was over it would sink 150 ships and kill 450 mariners. also covered is the incredible rescue crew headed by the world champion of lifesavers-captain Joshua James of the Point- Allerton Lifesaving Station in Hull, mass. [https://images-na.ssl-images-amazon.com/images/I/41NSxKEh0wL._SX331_BO1,204,203,200_.jpg] The author’s mentor, Mr. Edward-Rowe-Snow worked on the book for 35 years before his death followed by 32 years on Art Milmore’s part. The research totaled 67 years. The author saw 11 hours of underwater video on the wreck, and went on 2 oceanographic expeditions to the wreck. Books for purchase will be available. This entry was posted in General Meeting, Public Meeting and tagged Art Milmore, Steamer Portland. Bookmark the permalink.